Over five years ago, Gail Dalrymple, Robert Pierson, and I sat down to conceive of a performance company that would celebrate the creative work of adult actors with disabilities. 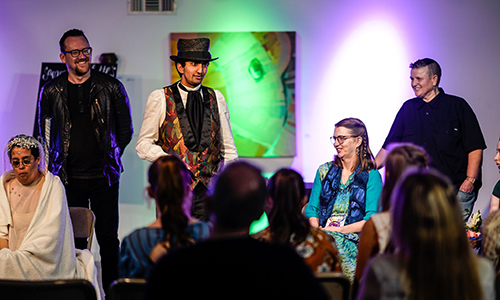 We saw the opportunity to establish a community of artists in Austin, Texas, who would tell stories of otherness, all the while challenging audiences to rethink commonly held perceptions of disability. We called it TILT. Like many new theatrical endeavors, we didn’t have a season or trajectory in mind when we mounted TILT’s first production, 45 Degrees. We were experimenting with an idea: what would happen if we invited actors with disabilities to meet and discuss topics that were relevant to their lives, honed in on a theme that we wanted to explore together, and devised a performance piece from those discussions? And what if we included a diversity of disabilities in our work, from blindness to Deafness, cerebral palsy to autism, and epilepsy to multiple sclerosis? That’s exactly what we did, and the formula worked. With a few tweaks along the way, it’s still the same philosophy and process we follow when devising works today. Like many theatre companies that create new work, we use a mix of modalities—improvisation, free writing, vocalization, physical exploration, theatre games—to formulate each piece from the ideas we’ve discussed around our chosen theme. The through line that connects all of TILT’s work is a unique philosophy and approach to the art: rather than produce work that focuses on disability head-on, we use allegory as a central approach to storytelling. While a canon of dramatic work that directly addresses disability directly already exists (The Curious Incident of the Dog in the Night-Time, The Boys Next Door, and Tribes, for example), we believe taking a broader allegorical approach affords adds a new dimension to the work and will help shatter stereotypes about disability. From the start, we sensed that devising new works with our company members would form a focal pillar of TILT’s work and that stories about individuals and communities on the fringes of society would tie in heavily. 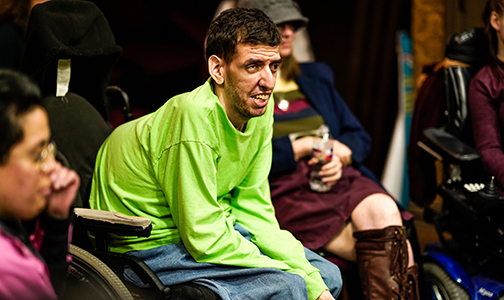 The theatre we create analogizes “disability experiences” through shared themes of importance and relevance to our company members, like access, otherness, marginalization, stereotyping, individuality, and status quo. We also set for ourselves the goal of diversity in the work we program, to include musicals, extant full-length plays, commissioned short plays, company-devised pieces, and performance art. Our roots in allegory, coupled with the many shared experiences of our company of actors, are what give us our particular hue. Allegories offer us a powerful lens through which to explore a particular theme or topic. We don’t use allegory to apologize or hide, but to interpret and elevate. When we produced an evening of ten-minute plays collectively called The Flip Side, for instance, we put out a call for script submissions that would address the question “Is the grass always greener on the other side?” Rather than requesting submissions of scripts that focused necessarily on disability, we explored the “flipped side” inherent in otherness of all kinds. 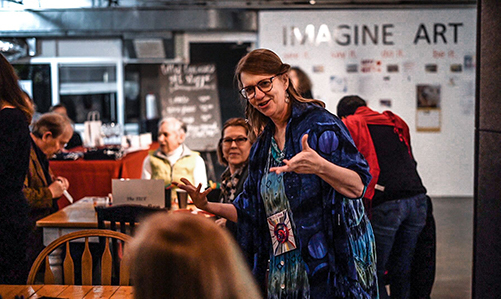 We saw the opportunity to establish a community of artists in Austin, Texas, who would tell stories of otherness, all the while challenging audiences to rethink commonly held perceptions of disability. TILT’s inaugural production, 45 Degrees, explored both the benefits and challenges of technology, a topic that emerged as important to the cast throughout our first couple of rehearsals. This eventually developed into a central metaphor of connectedness; by exploring the various impacts of technology on the lives of those with disabilities, we sought to illuminate experiences common to both our company members and those living without a disability. Devising the show as a company, our goal wasn’t to show how technology has an impact on people with disabilities, it was to illustrate the intersections of connectedness among any number of communities who might experience technology in both shared and unique ways. It might be easy to assume that devising sessions comprised of actors with disabilities could be a prohibitively arduous process, but at TILT that couldn’t be further from reality. Guided communal conversations elicit ideas that become writing or improvisation assignments, which in turn result in storyboards, which lead to a fully scripted work. Our devising sessions continuously challenge us to challenge one another, and that’s thrilling. When we begin to devise a new show, the whole company talks through potential themes. Some team members, particularly those with intellectual or developmental disabilities, primarily assume the role of active listener in these sessions and generally require some encouraging to participate with contributions of their own. But it’s not always the director who’s doing the encouraging; frequently, it’s the company members themselves. We begin by discerning a particular challenge that’s frequently encountered by a number of our performers. For instance, our immersive production I Wander centered on the joys and challenges of mobility. The topic is a salient one for many of our company (and audience) members, who navigate the world in a wheelchair (“on wheels,” as they declaim in this production) or with the assistance of a cane (“with sited stick”). The play asked “What does it mean to wander?” and, while audiences literally traversed the space alongside the performers, that question was contextualized in the experience of those for whom wandering is not always an easy endeavor. Over the years, as we continued to refine our process, it became clear very quickly that we had a lot of expertise in the room, and that was something we wanted to harness and apply. For example, included in our company is a licensed professional counselor, a theatre teacher and director at the Texas School for the Deaf, a seminarian who holds a graduate degree in literary arts, and a rapper who brokers real estate. 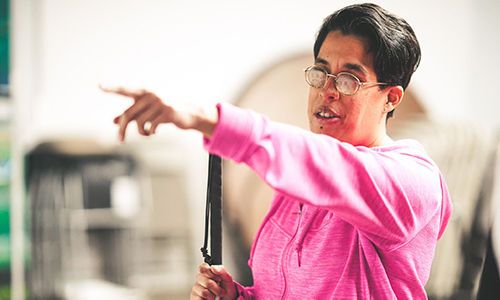 We actively seek to engage the professional expertise of each and all of our company members in every devising session, instead of assuming that a company comprised of members with disabilities means that there’s no expertise in the room. Doing this, we’'re able to create authentic characters and situations that mirror our actors’ own careers, backgrounds, and diversity of perspectives. Having someone at rehearsals whose role is to attend to logistics outside the artistic process has proven paramount to having successful, fun devising sessions. Logistically, we’ve found that it’s especially helpful to have a volunteer on site at each rehearsal to assist company members with particular requirements or to recommend a quiet break for others when such a suggestion seems beneficial. Oftentimes, the volunteers come in the form of caregivers or family members. Having someone at rehearsals whose role is to attend to logistics outside the artistic process has proven paramount to having successful, fun devising sessions. We’ve also found that discerning a standard rehearsal timeframe has proven valuable. Typically, TILT devising sessions and rehearsals last between two and two-and-a-half hours and are often coordinated around logistics such as transportation availability, jobs, and medication schedules. Similarly (and perhaps somewhat obviously), accessible spaces that are conducive to discussion and movement—yet as devoid as possible of factors that might contribute to sensory overload—have become important to our process. The implementation of a variety of activities and modalities is also a significant component of our devising sessions. We break up our verbal discussions with free-writing assignments, improvisatory work based on a prompt initiated by a discussion topic, art-making projects, and other activities. Beginning with rehearsals for our next production, we’ll be incorporating a curated set of warm-ups, in addition to a ten-minute social activity, in order to create an even stronger bond among our company members. By doing so, we hope to establish a more predictable process for each rehearsal itself, with common guidelines for expectations with regard to entering the space, participating actively, and pursuing community with one another. As TILT developed throughout its first couple of years, in addition to devising our own shows, we began mounting existing works. But we found ourselves surprised by the number of inquiries we got from returning patrons wanting to know whether our next show would be a TILT original. I think this craving for original work is in large part attributable to the agency of our company members, their unique perspectives, and the ways in which our projects are chosen, devised, and curated. During the performances that seem to connect most with audiences, there’s a certain palpability in the room. Through the analogizing portal of allegory, we’re able to transport our audiences into another world to consider some very salient and practical topics. 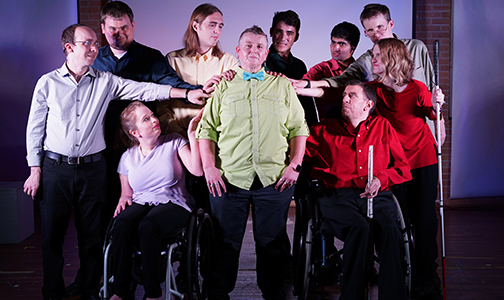 TILT’s goal is to shatter stereotypes about disability through live performance. By selecting topics relevant to the experiences our company members share and spinning them through new lenses in our devising process, we’ve been successful in creating new works that entertain, challenge, and inspire both our actors and our audiences. It’s a process-to-production approach that we hope to iterate and implement well into the future. Thank you so much for sharing these excellent insights into your process. I'm so happy that you are making such thoughtful work in Austin! You make a powerful point - recognizing the experience and knowledge of the group in their lives beyond disabilities, then building stories and theater experiences on that foundation, not focusing on stories about the physical challenges.